Awww, I have the cutest little items to show you today. Ones that will get you all excited for children’s apparel. Barbara, from Up To My Knees In Crafts, is a mom that is just that…….up to her little knees in many craft projects. I love that! And she has the sweetest little shop, that is filled with the most darling and uniquely hand crafted items. Ones that you will most certainly fall in love with. Just check out this Corduroy Jacket with Flower, found here. That jacket has such a cute little swing to it too. Darling for fall. And what about these little Smocked Denim Overalls, found here. Awww, perfect little boy outfit. Wow, that smocking is just perfect. And how can you not love this Pillowcase Fashion Top and Pants, found here. Check out that big blooming flower. Perfect combo. 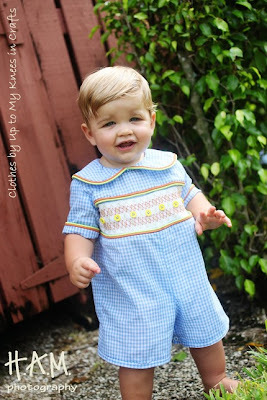 What about this Custom Smocked Romper, found here. Can you just see this on your little boy at Easter time? Or at church? And oh my, we definitely need this Dress and Jacket combo, found here. Is your heart just melting? 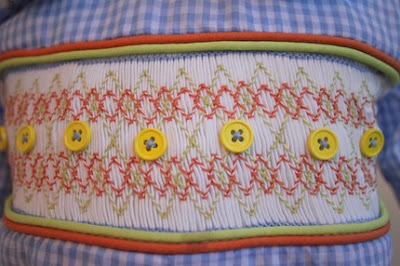 Barbara definitely has an incredible talent when she sits down at her sewing machine. And she has many more things that will surely catch your eye. 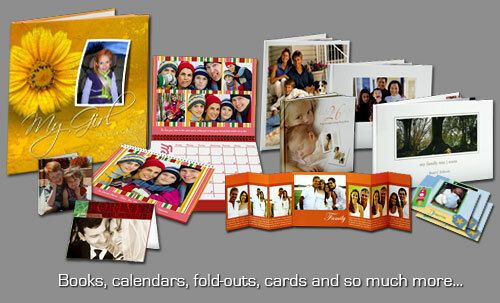 And Barbara also has a love for scrapbooking and documenting all of her memories. She works with a lovely company, Heritage Makers…….where she is able to create her own memory books, cards/announcements, photo gifts, and more. Take a look here. And yes, Barbara is very excited (and generous) to give away several different items to a few of you readers of Make It and Love It. A $50 gift certificate to her Up To My Knees In Crafts shop. A $25 gift certificate to her Up To My Knees In Crafts shop. An 8×8 Storybook, found here (which includes 21 pages that you get to customize with your own pictures and text) from Heritage Makers. Just think, this may be your lucky day. Visit Up To My Knees In Crafts here, and browse around for a bit and choose your very favorite item over in the shop. Then come back and let me know what you like, in one comment. I would probably have to say the tutu as well. it would look so cute on my little girl! i would definitely have to put her through a photoshoot for that! I love the cordorouy coat! I'm not sure how much use it would get since we live in the south, but my little girl would look so cute in it! I LOVE the corduroy jacket….actually I want one for myself! HA! Thanks! I love that dress/jacket combo! So cute. My little girl is due in January and that would be so cute for church! I love the Pillowcase Dress with Flower…. adorable!! 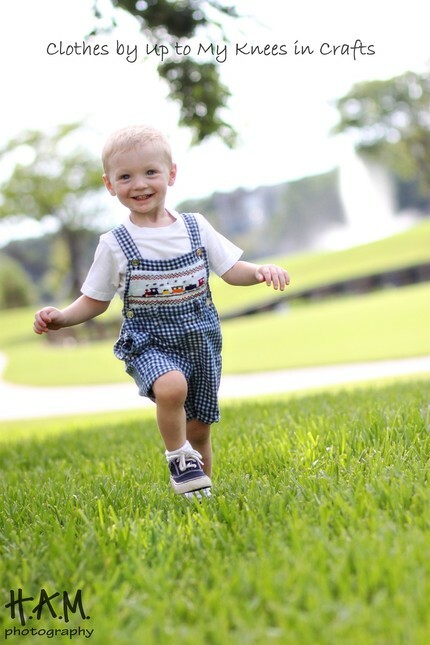 My family only has boys – so I bypassed all the girly things (sadly), and my favorite item is http://www.etsy.com/listing/54870406/all-about-the-boy-custom-smocked-romper. I LOVE the dress/jacket combo. I could totally see my girls wearing that! I love the formal infant/toddler coat. I have two girls that it would be perfect for! I love the formal todler coat and the rose tutu! I like the cordorouy jacket with flower. It is so cute! I love the everyday dress and the corduroy jacket! I am just in love with the corduroy coat, or the tutus, but the coat is my favorite for sure. I love the brocade jacket and satin dress…however, my littlest munchkin is too big. The Everyday Dress is beautiful too, and I love the color! And her tutus are adorable! 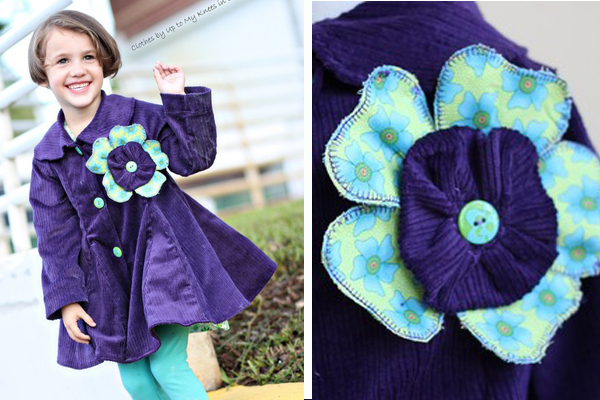 That purple corduroy jacket with the big flower is my favorite! And with fall coming up, would be perfect on my little sweetie! oh my gosh she is talented! I am loving the serious little spider tutu! Or the everyday days! I love the pillow case clothes. Adorable! I'm in love with the Tutus!!!! The rose tutu is adorable. I love the corduroy coat. Its beautiful! love the spider or pumpkin tutu for halloween! i'd have trouble deciding which one. 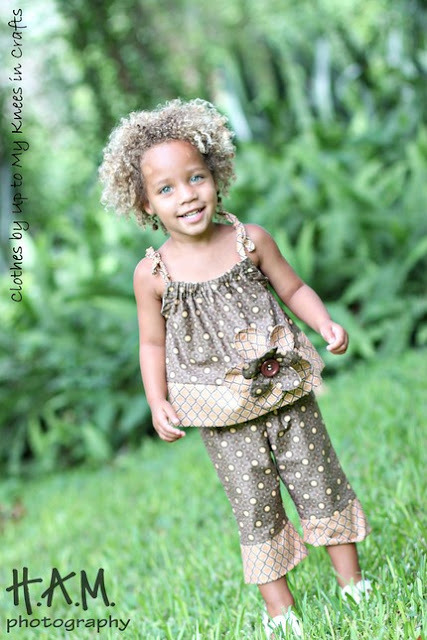 I love the Pillowcase Fashion Top and Pants Custom…So Cute! seriously those tutus kill me i love them…and those pillowcase dresses…genius! I absolutely love her Lilac Custom Smocked Dress with bloomers!!!!! It is soooo stinking cute! Love that she has boys clothes too that are adorable! The dress/jacket combo or the little swim suit are my favorites! I love the newborn smocked dress how cute!! I think my favorite thing is the purple corduroy jacket. I've got 3 little girls that it could be passed down through! !Love it! Very cute! I'd definitely want to do a custom smocked dress for my baby girl. But those tutus are adorable too! Love the fun coats that she makes. I think my little girl would look so cute in a tutu too! I love the "Big and Little Sibbling Onsies"! Everything is absolutely adorable! I adore the dress and jacket combo. My little almost 3 year old is already wearing it in my mind! I'm pretty much in love with the corduroy jacket! Oh my I love them all! I think my favorite would probably have to be the formal coat dress combo. It is so adorable! I really like the corduroy jacket and flower!! The Tutu's are cute too though!!! I really love the dress and jacket combo and all her smocking is lovely! I love the Pillowcase Dress with Flower! It would be perfect for my girlie! I love the vintage coats. I'm such a sucker for little girl coats though, lol. The spider tutu is adorable and so is the baby in it!! It is all so adorable, but I have to say my favorite is the dress and coat. Oh my. SO CUTE! I love, love, LOVE the lilac custom smocked dress with bloomers. So sweet. I'm still a sucker for a cute pillowcase dress! I am in LOVE with the corduroy jacket! It is adorable!! Love the corduroy jacket – but the tutus are soooo cute too. The pillowcase outfit would probably be my choice for a new granddaughter coming in December! I absolutely fell in love with the dress and jacket combo! It's so gorgeous! 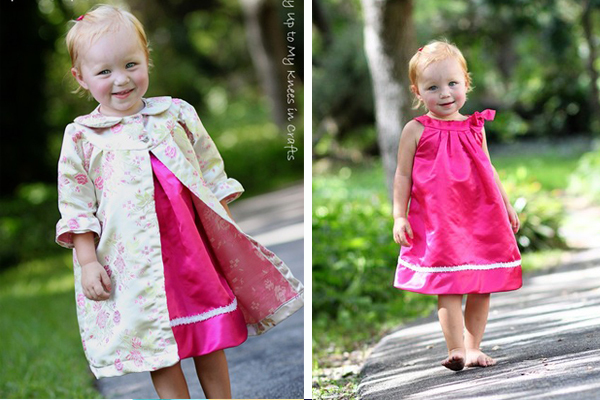 I love the Lilac Custom Smocked Dress with Bloomers and the formal toddler coat. The tutus are so cute also! I LOVE the little jacket and dress combo! I wish I knew what this baby was going to be–2 more weeks, eek! For now, I love the pillowcase dress! I love the everyday dress. simple & beautiful! I really love the corduroy jacket with the flower. It is so darn adorable. The toddle coat is so cute!! Everything is precious, but I LOVE the satin dress. The purple jacket is the most adorable thing! I love it and want one. I like her Little Breeze smock dress, and the Pillowcase dress. 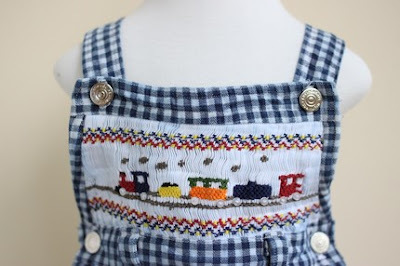 So adorable-and I love that you can choose your own fabrics and colors. I am in love with the "Serious Little Spider TuTu!" TOO TOO CUTE! I love her big and little sibling shirts! Way cute! Can't make up my mind between one of those darling tutus and that dress coat combo. Adorable! I love the dress and jacket combo! So cute! I love the dress and coat combo. The smocking is gorgeous! I love the everyday dress! Even though I have two little boys, I love all of the girl clothes. makes me want to have a little girl! I love the What's in the Meaning of a Name t shirts!! love the dress and jacket combo. I love the pillow case dress with flower!! So adorable! I love the Little Breeze smocked dress. I can sew but I don't smock and I love it. My mom does smocking but hasn't done anything in a long time. Love the infant tutu. I also like the cute little onesies. I would like the formal infant coat for my little girl. It is too cute. That little girl jacket is so darling! I adore the dress and jacket combo. So cute! I love love love the dress and jacket combo. What a gorgeous holiday outfit! Seriously some of the cutest stuff! My fave is the pink swatin dress and coat. It would be adorable on my little girl!!! I love the Dress and Jacket Combo for Infant. It's sweet! I ADORE the pillowcase dresses with the huge beautiful flowers! Very cute! Hands down the curdory jacket. I have never seen anything so cute! 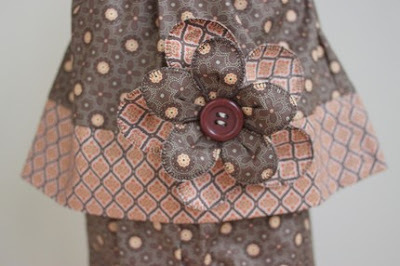 I absolutely love the pillowcase dress with flowers and the purple corduroy coat. Everything is adorable. I love the little breeze smocked dress. Such cute things and so generous. I love that "Born to Explore" onesie! We love the Everyday Dress. My daughter said "I want that one"!